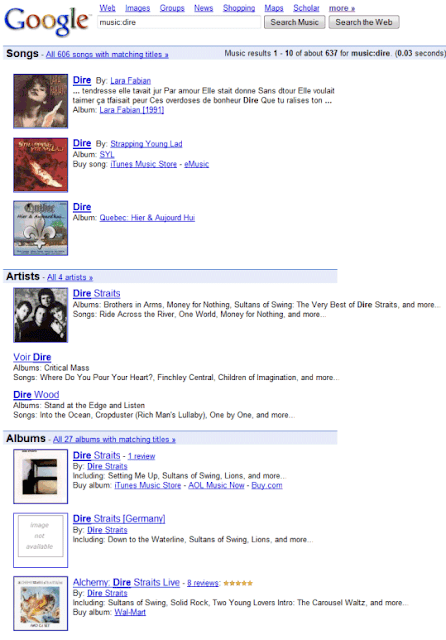 Google has a small music search engine that shows information about artists, albums and songs. 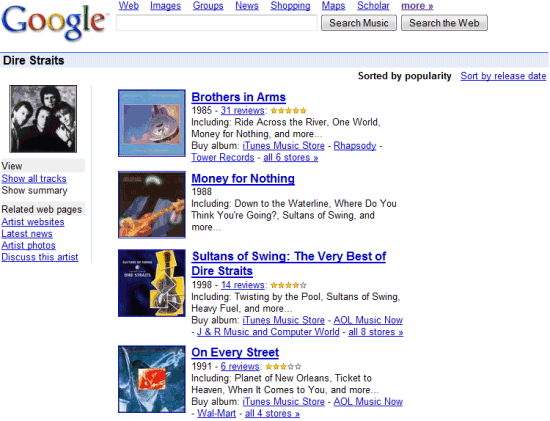 You can use the music: operator in Google's search box to access the service. Unfortunately, the information is outdated, the links to reviews are broken and there's not much to see. After many years of decay, Google decided to improve the service. CNet reports that Google will launch the new version of Google Music Search next week, in partnership with Lala and iLike. "The way One Box will work is that a person who keys in the names U2 or Coldplay, for example, will find a thumbnail photo of the artists, background information, as well as a listing of the music that they can preview." "The new Google music offering will allow users to stream an entire song via a link from La La Media Inc.'s Lala.com, or a sample from MySpace's music site iLike.com. 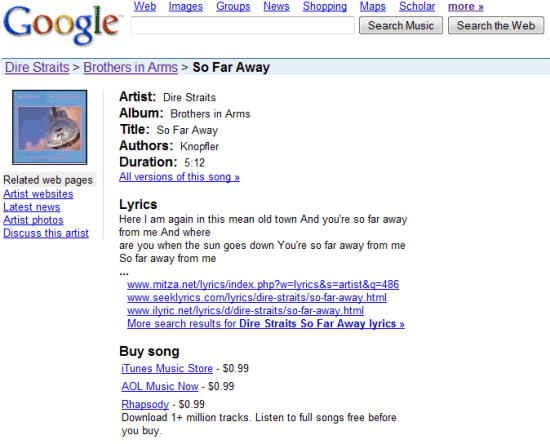 The Lala link on the Google page will let users listen to a song once free of charge. In addition to offering a free streaming link, the new arrangement will offer options to pay 10 cents for an online-only version or about $1 to download an MP3," says the Wall Street Journal. TechCrunch has some screenshots of the OneBox and the interface resembles Yahoo's music artist shortcut. Last year, Yahoo partnered with Rhapsody to allow users to play up to 25 full songs a month. Google's most popular music-related service is YouTube and it's surprising that YouTube doesn't offer a better experience for watching music videos. YouTube could easily add information about music artists, lyrics, album arts, music charts. Later this year, YouTube will launch Vevo, a site that will feature Universal's music videos. This is a very useless search. 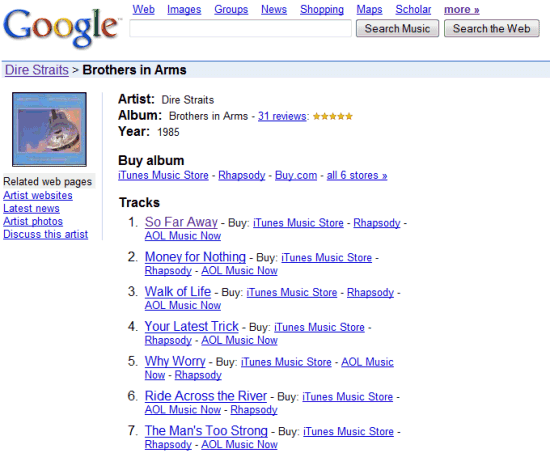 You are never let outside Google - unless it's to go to the Amazon music store. how come i see it already if it is coming out SOON? You're seeing the version launched in 2005, which doesn't include a music player. I'm missing this feature. I trying to find out if Google is just hiding it somewhere or if it's been killed altogether.